Moving can be a difficult time for children. Once all the packing and moving is completed, now they need to settle into the new space. For children and teens, this may be the hardest adjustment they have to make. Saying goodbye to old friends was difficult, but the excitement of moving to a new home, a new neighborhood can sometimes reduce the initial anxiety they might feel. So, to help them make an easier transition, here are some tips and suggestions that you can plan to incorporate into the first few weeks after you've moved. Even if your family has seen the house before, take a tour to help everyone get familiar with your new home. Walk them through the space discussing what each room will be, describing how it'll look, what activities will happen there and ask what each member thinks about organizing the space. Cover every room, including the yard and garage, then let them take their own time to explore it. For some families, we suggest playing hide and seek or tag; a game that encourages children to explore. A game that usually works quite well is to create a list of questions that the family members need to answer. Make it like a treasure hunt, with teams and prizes. Examples of questions are: which room is the largest? Which room faces northeast and has two closets? How many bricks are on the front of the fireplace? This is a fun way to find out more about your home and to explore its every surface. Make sure every member of the family packed an essentials box for themselves. For kids and teens, this should include their favorite things, whether its music, games, books, journals or pictures, encourage them to pack everything together so that all the things that are meaningful for them can be unpacked first. For most moves, you want to make sure that everyone takes this box with them instead of with the movers (if that's feasible), just to make each member feel a little sense of home their first night. The first room you should really unpack is the kitchen, so you'll usually just unpack the basics — the things you'll need for the next few days. After the essential kitchen items are unpacked, start with the kids' rooms. Getting each child to unpack their own stuff (with help, of course) and talking to them about how they'd like their room arranged (if this hadn't been pre-planned earlier), will help them feel like the new space is theirs and they will soon settle into their new room. Usually, the rule is, the sooner a child's room is unpacked, the quicker they'll adjust to space — it's just common sense. Most people like routine, especially children and teens. For the first night, you may let the younger members of your family stay up a little longer just to make the night special, but after that, it's important to establish a daily routine. Keep bedtime hours, mealtimes and playtimes consistent. This will help everyone to feel more settled. It's difficult enough to have had their lives disrupted by a move, but to disrupt the daily schedule is even more detrimental; if children are acting out, try normalizing your day. If you used to take the kids to the park in the afternoons, find a local park and reschedule this into your day. 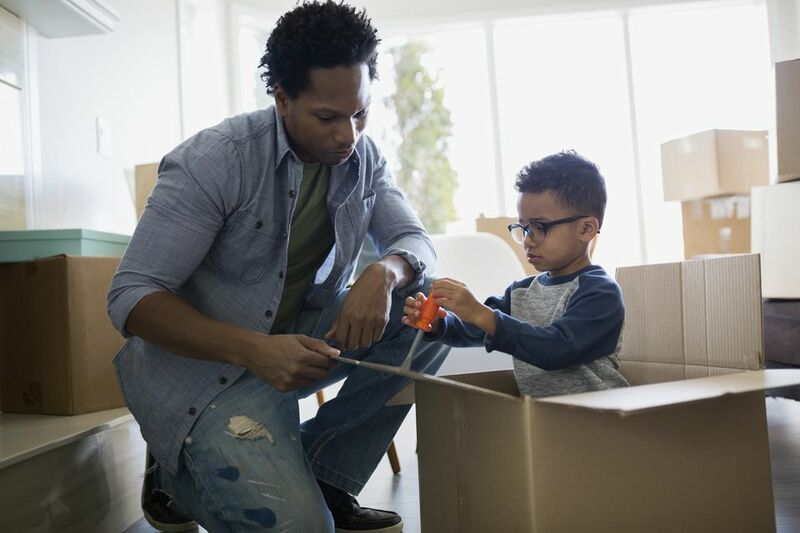 We know it's tough — especially for the parent who's at home trying to put the house in order — but part of the moving in process is also settling in the family. In addition, each parent needs to take this time out, too, to enjoy the new home and neighborhood. If you can afford it, consider hiring​ professional unpackers to help; what may take you days or weeks to complete, unpackers can complete in a day.